You are at:Home»Articles»UK & India: Where are we heading? Our cover story this time is aptly titled ‘Yeh Dosti’. Indian readers will be familiar with the eponymous song from the iconic Bollywood blockbuster ‘Sholay’, which, even 42 years after its release, remains synonymous with undying friendship and renewal of relationships. To dwell a little further on the renewal analogy, here in the UK, we have the custom of spring cleaning, where in anticipation of sunny times, and coming out of the winter months, we clear out the clutter and put our house in order. The tide of history has brought India and the UK to such a turn in the road. 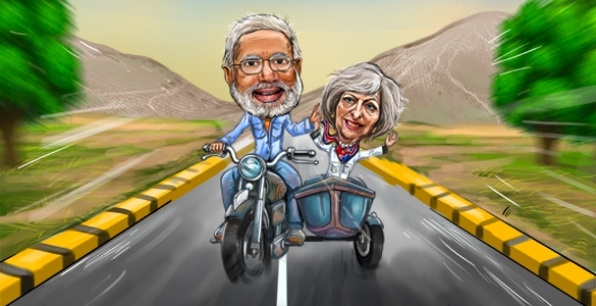 Coincidentally, PM Narendra Modi’s vision of embracing globalisation to expand India’s economy and realise its ambitions of taking its rightful place at the global high table has some resonance with PM Theresa May’s ambition of a post-Brexit “Global Britain”. There are, or will emerge, vast areas of synergies the two countries can exploit for mutual benefit as well as for the greatest common good of all humanity. Or, in Narendra Modi’s language: “Sabka Saath, Sabka Vikas”. But it will not be a straight and easy road. The challenge is to prevent the relationship from becoming transactional. There will always be the clear and present danger that we may have become too comfortable, and mistakenly assume that cultural affinity and a centuries-old bond will survive the ravages of a rapidly churning world order. India and the UK need to re-imagine the relationship, re-calibrate the scales by which we judge proximity and warmth and do it fast. Trade is the obvious area of synergy. India is the third-largest source of FDI into the UK and the UK is the largest G20 investor in India. Despite this, UK trades more with Sweden, which has a GDP that’s just about a fourth of India’s, than with India. We can obviously do better. And, despite my view that the UK should have remained in the EU, Brexit could just offer that opportunity. A renewed relationship also means May’s government must show greater empathy for Indian demands for concessions on immigration, as higher education for its youth and free movement of its professionals are key to keeping the wheels of its services-dependent economy greased. At the same time, India must accept the compulsions of Her Majesty’s government to respect the Brexit sentiment, which was, in essence, a vote against untrammelled immigration. But movement has been slow. For instance, several months ago Britain’s international trade minister, Dr Liam Fox, announced a working group to start pencilling in the contours of a new post-Brexit trade and investment relationship with India. This is a welcome step forward. But we must avoid bureaucratic fudges. Its work must be open, transparent, and allow a wide cross-section of stakeholders to engage in a meaningful manner. Modi has called the Indian diaspora in the UK the “living bridge” between the two countries and has actively sought to engage them in the process of bilateral cooperation. But does the DTI or British High Commission in India have a strategy for diaspora engagement? Taking a leaf from Modi’s book, May’s government, too, can reach out to this living bridge – and the ongoing India-UK Year of Culture presents just the right platform. My fabulous team has made a small beginning by recognising and celebrating the achievements of such people with the India Inc. curated ‘UK India 100’ list of most influential people. The potential is there for all to see. The tide is right and if May and Modi can take it at the flood, it can lead on to a great future for both countries. History is replete with examples of individual leaders transcending their situations to lead their countries to ever greater heights. In the UK and India alone, there are examples such as Winston Churchill, Mahatma Gandhi and, potentially, Modi himself. Can he and May move to the melody of ‘Yeh Dosti’? If they do, they will have re-written the future of UK-India ties in golden letters. This article was first published on India Global Business Magazine‘s Special Edition.